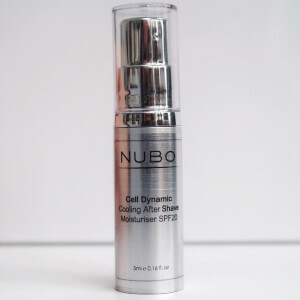 Make your skin work smarter with the brilliantly engineered NuBo Cell Dynamic Cooling Aftershave Moisturiser SPF20 – the optimum post shave solution for skin sensitivity, dryness and irritation that works equally well when reviving tired complexions. Inspired by performance, speed and luxury, NuBo has developed Cell Dynamic Cooling Aftershave Moisturiser SPF20 to provide immediate visible results and lasting benefits. Stimulating your skin’s ability to rejuvenate itself, this post shave wonder also refreshes, calms, cools and provides deep, long lasting hydration. With SPF20, your skin is protected from external aggressors while the Cell Dynamic formula can get to work energising your skin at cellular level to prevent wrinkle formation. Follow with a few drops of NuBo Cell Dynamic The Essence For Men for optimum results. * Please note this item and the whole NuBo brand cannot be shipped to the USA.